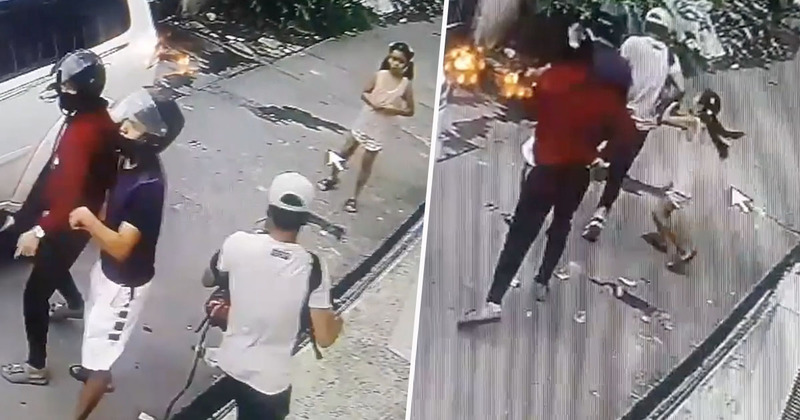 The astonishing moment an eight-year-old girl stood up to armed robbers, moments after they mugged her father, was caught on CCTV in Cavite, Philippines. The schoolgirl, Brielle Minia, was playing on the driveway outside her home when four men walked past posing as DVD sellers last Thursday afternoon, (September 27). Three masked men approached her dad – who’d just returned home from work in a white 4×4 – and held him up at gunpoint to steal his cash, while a fourth member of the gang raided Brielle’s family home. As the group ran back down the driveway, the only person between them and their getaway motorcycles was the little girl, who was walking back to see what the noise was. In the video, you can see Brielle bravely lunge towards the same man who’d been holding a silver semi-automatic handgun moments earlier. She quickly ripped open his bag, scattering the contents – the items he’d stolen – across the floor. The youngster then frantically tries to gather up the items as the robber runs off. Incredibly however, the fearless eight-year-old gets to her feet again and sprints after the criminal, hurling herself at him for a second time as he tires to climb onto his bike and make a getaway. Brielle is then kicked to the ground. She suffered cuts and bruises to her face and hands as well as a suspected broken nose. I’m so angry they stole my daddy’s money. If I ever see them again they’ll be sorry. Brielle was certainly brave standing up to armed gunmen. Thankfully the youngster and her family managed to escape the ordeal without any serious injuries. Another bungling thief was caught on CCTV being locked inside the store he was attempting to rob. Filmed in Washington DC, the hapless shoplifter had been spotted dozens of times casually walking out of the petrol station with handfuls of items. While staff were distracted, he’d grab snacks and drinks and just walk out without paying. Amazingly, he’d keep going back to the same store. This time however, staff were wise to his moves, and locked the door as he tried to escape, again with handfuls of items. Seemingly alone in the store, the petty criminal stands on the mat by the door, trying to plead with the staff behind the counter to let him out. After trying to escape by talking and begging his way out of the situation, the crook eventually tries to break out by running and kicking at the door. In the end, the guy manages to break the glass on the door and is able to flee, although I’m sure karma caught up with him sooner or later.